As is typically the case when it comes to Apple's computer line, the company has upgraded its MacBook Air with little fanfare, aside from a press release. This rumor has been floating around the blogosphere for the last few days, but today the company made it official. According to the release from Apple, there are several changes to the line. First is a price drop. 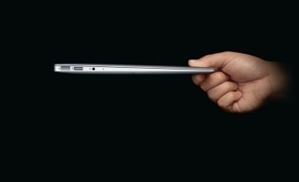 The slim laptop will now start at $899 for the 11-inch, 128GB version, which is a $100 less than the previous model. The 13-inch will start at $999, which is also down $100. Base models start with 4GB of memory and 128GB of flash storage. Upgrades can be made to 256GB for $1,199 or 512GB for an additional $300. Memory can also be increase to 8GB on all machines for an increased price of $100. All machines have Intel HD Graphics 5000, run the latest version of OS X Mavericks and has both the iLife and iWork software suites free. "Macs have never been more popular, and today we've boosted the performance and lowered the price of MacBook Air so even more people can experience the perfect everyday notebook," Phil Schiller, senior vice president of worldwide marketing, said in a statement. This is the first major overhaul to the MacBook Air lineup in several years, aside from the inclusion of the new "Haswell" 4th-generation processors from Intel, which were revealed during last year's Worldwide Developers Conference. The new laptops are officially available now. Shipping on the website is stated at 24-hours and retail stores are also fully stocked with the new models. if tradition serves true, the now older models will also be discounted so Apple can sell through its remaining inventory. Any new product line launch is going to spark sales, especially when it comes with a price drop. This could be the perfect time for companies considering investing in new portable computers. With the help of a consulting firm that specializes in Mac IT support, any company can easily deploy these products.